Filmic James | I dribble alot on here. While everyone is busy talking about micro-transactions in $60 games, and, more recently, Payday 2. I want to focus on something else that Overkill Software seems to get away with when it comes to extracting cash from everyone’s Wallet. I’ll get to the micro-transactions in a bit, but That “something else” i just mentioned is referring to the abundance of DLC for the game. It’s just absurd. Before I get too critical, I must point out that it’s a fairly good system, if a bit unorthodox which is entirely optional for you, with the only popups being on the main menu, the load-out slots, and the trailer for the latest heist put up on Youtube. Simple marketing. That’s it. What’s even more consumer friendly is that if you play online with others With the DLC, ALL PLAYERS, regardless of rank, get the DLC so you’re on equal ground with each other. It’s not without it’s flaws because, as I mentioned in a blog post about On-Disk DLC a while ago, The DLC isn’t downloaded when you click “Buy”. It’s packaged with the game, which is why your friends can enjoy the same equipment you have, without them downloading anything on their end. If you thought that was the problem, well… it isn’t. Not in this case anyway. Now here is the problem with this: With notable exceptions of the oldest DLC packs Overkill has released, a staggering 27 other packs are monetised. Twenty Seven. That’s a big number. In a recent AMA, Almir Listo, Producer of Payday 2 among other things, was quoted as saying “we do free updates when we can, and paid DLC when we have to”. Let me say this, Almir: You have 27 packs out already, and there has been a New DLC pack/ update almost every 1-2 months. Are they not aware that, and I can’t say this number enough, Twenty Seven is a big number?. Something tells me this not Almir talking, rather someone from Overkills PR department trying to clear up their own mess…and failing. 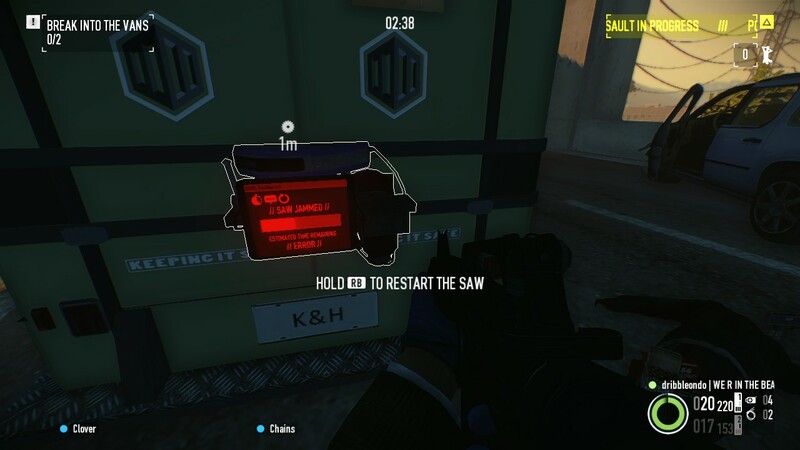 Because Overkill went Overkill on the DLC, ha ha, and because recent events such as the Team Fortress 2-esque crates and Keys..sorry…Safes and drills, which gives you skins with attributes for weapons you may not even own. And not because you haven’t earned them either. Because you may have to buy DLC to use the skin. Hmmmm. I’ve seen comparisons on forums that shout out both the aforementioned Team Fortress 2 and Counter Strike: Global Offensive because they use the same system. 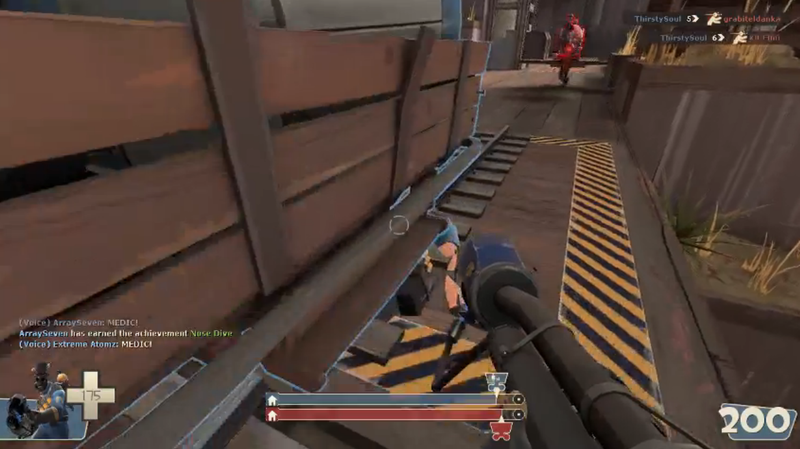 Firstly, TF2 is a Free-to-play game. It’s how valve and, more recently, community map makers who are lucky to get their creations into the game, make their money. The argument towards CS:GO is a bit more understandable, but the crucial difference is that the skins you get in CS:GO and TF2 were applied to the weapons already, and you got them by going to the market or via a drop from the drop system, doing a trade up contract, or unboxing a crate with, yes a Key. But something that’s optional for you to get. Skins in CS:GO don’t affect gameplay. Which is fine. 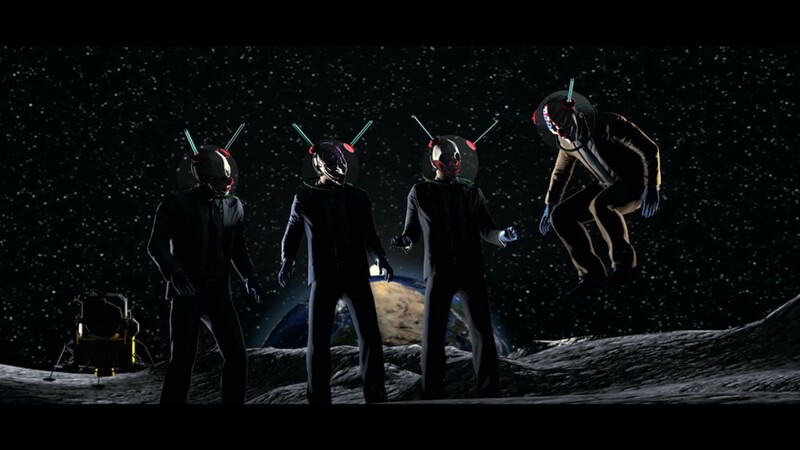 Payday 2 skins do. It’s a truly bizarre system, I grant you. To some extent, I was fine with Payday 2’s over-abundance of DLC, as it wasn’t exactly necessary. And even then, Overkill had regular sales on the game and it’s additional content anyway, so not many people gave it second-thought. I totally understand DLC characters and Heists, but weapons? I’m not sure about that. But doing micro-transactions and DLC is just greedy, and you know it Overkill. The strange part is, is that Payday 2 is a genuinely fun game to play, despite the amount of bugs, glitches, and now Micro-transactions, in the game. That’s why the Payday community is so unhappy about this situation. This is the problem when you release too much of a good thing. To make a long story short, my family recently got an Amazon Fire TV. It solved a problem plagued by many families for many years. Requiring Xbox Live to use Netflix. Yeah, sure, some of us have Wii Consoles, but not all of us like the Wiimote and it’s annoying accuracy issues sans-Wii Motionplus. Hence, The Fire TV was bought. On the face of it, The fire TV looks like a pretty good deal. You get a Fire TV micro-console, with possibly the nicest remote control I’ve ever seen. Cheap produce this ain’t. Even without Amazon Prime, it still gives you access to on-demand services, such as the aforementioned Netflix and BBC iPlayer. Then things go downhill. Very downhill indeed. You see, While it’s oriented towards annoying customers into buying Prime nudging you into the Amazon Prime ecosystem, it’s determination to do so is quite intrusive. Admittedly, if you bought this anyway, chances are you were getting Prime in the first place. But it’s still annoying. The Movies, TV sections are all off-limits without Prime. And that’s not even getting started on the restrictions. The Fire TV, at it’s core, is Android. Specifically, it’s Amazon’s own implementation of Android KitKat. Because of this, there’s no Google play, No Gmail, no Google+ (+1 points for removing G+ amazon!) Not even YouTube. What’s even weirder is that, because of these restrictions, the apps in the Fire TV store is so limited, it doesn’t even compare to Amazons OWN Appstore for Tablets or their HDx lineup. Even worse, is that all the apps that did get on there, are missing features in some way. The Twitch app, for example, doesn’t have a Game search feature, present on Tablet editions. While the specs for the Fire TV are, admittedly, more than decent for the £65 spent on the thing, it performs very well in all the tests I could muster in terms of the Games dept. Also, unless you want to Root the Fire TV, you can’t use any old USB controller (Like you can on Android). You are limited to the Logitech branded USB controllers, and the Fire TV controller. Which is £40. No. Just…No. Overall, I like the Fire TV. For the money my family spent, we knew what we were getting into. However, I do find it dissapointing that the lack of any web browser, Youtube, or decently optimised apps shocking. 6/10. And that’s me being generous. It may not surprise you all that I very rarely download DLC for the sakes of owning it. Don’t get me wrong, I own DLC for games, and I’m more than willing to pay for it, so long as it’s priced as reasonably as possible, and that I find it useful and enjoyable for me. The most recent actual-DLC I bought was Don’t Starve’s Reign Of Giants DLC, which I bought at the Steam Winter Sales, along with the base game and Don’t Starve Together Beta. I bought it also because, even with the DLC included, the Don’t Starve Mega Pack was £13.50. This was a good deal. An oversight by Klei however made it cheaper to buy the Don’t Starve Frontier pack (Don’t Starve + DST-ß + an extra copy for a friend), and then buy the DLC, which was 99p, separately, saving about a quid on my part. My point being is that downloadable content shouldn’t be part of the game when you start selling it. Essentially what they’re doing is shipping the content the developer and publisher intentionally calls “DLC” and keep it in a separate folder on the disk, and when it does become available to the public, it’s put behind a paywall. This is On-Disk DLC. I personally call this a “Content Paywall”, very similar to Day One DLC, except released later on. It’s exactly what the practice describes. So what about that certain fighter series made by HAL Labs & Nintendo? Y’know the one. Specifically the 3DS edition. Well, Smash 3DS is a bit of an enigma, wrapped up in mystery, that only the most prevalent hackers know how the game works. Sakurai himself stated back in 2014 that DLC may come to both Smash 3DS & Wii U, all depending on sales of the Mewtwo DLC, and if the demand for it is there among fans (who wouldn’t want Roy from Melee or Ryu from Street Fighters in Smash?) Sakurai called it an “Experiment”, not an investment opportunity. While there was intent for DLC, neither Smash 3DS or Wii U had Downloadable Content within it’s cartridge/ disk’s internal files. 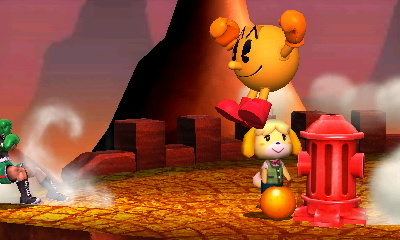 In fact, the only files related to DLC in the game files of either version at launch, were 2 sets of 2 buttons for character and stage selection respectively (which ended up being never used outside of the Smash Direct Preview). This alone isn’t On-Disk/ On-Cart DLC. This is compatibility for Potential DLC. True to his word, it was in the files as an optional extra. The Cutting Room Floor Wiki Pages (a website dedicated in uncovering unused content in games) for both Smash 3DS and Smash Wii U, support this argument. When the game got updates however, that’s where things got shady. 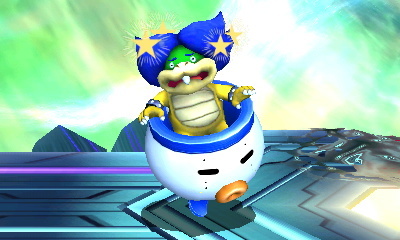 With the exception of a few updates, most other updates to both versions’ of the game add voice files, stages and characters, all which are eventually placed behind a Paywall. Hence; “Content Paywall”. Props to Nintendo in advance for calling it AOC (Additional Online Content), rather than DLC (DownLoadable Content), as that’s actually more accurate in what you’re doing; Downloading a “Key” to unlock the content already inside the game. 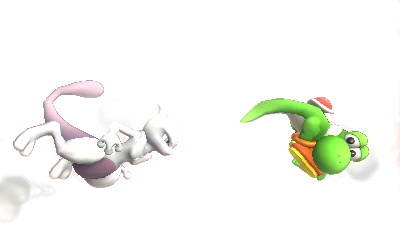 I can’t speak for the Wii U version of Smash, but this sort-of makes Smash 3DS’s On-Cart AOC a bit more acceptable. I’d rather download the content via eshop in the update itself & “unlock it” by paying an (not too unreasonable) amount of cash, in contrast to Downloading the content on my already-sluggish old 3DS via the Smash 3DS AOC Store, or when I need to join a match who are playing as AOC characters. No other publisher I know of calls on-disk/ on-cart Downloadable Content a more accurate name, except Nintendo with the aformentioned AOC. I can, of course, be wrong. Mobile games do what Smash 3DS is already doing, and so does Steel Diver: Sub Wars. And the extra content in SD: SW is only 79p per sub. Not bad at all for a Free-To-Play. Paying for the content already in the game and calling it DLC, when it requires no downloading of said content whatsoever needs to stop. Admittedly, it still annoys me that content is behind the paywall, but, at least for the 3DS version, it’s understandable. I’ve said it before, and i’ll say it again; I’d rather play against those with AOC and regulars when I know the characters are behind a paywall, rather than “Temporarily download fighters & Stages” every sodding time I start a new Online session. Convenience beats Gaming Ethics. Rock beats Scissors. TXTSPK beats words. Who has the better Tail? Listen, Valve, we’ve had our good times and our bad times. I’ve seen you do great things, and I thank you for getting me into Team Fortress 2. But I have one problem with our relationship. And I’m not talking about the overpriced-sombrero you have up for sale on the TF2 store. No, It’s not about Snowplow being cut either from the End Of The Line Update. It’s simpler than that: I’m talking about the frustrating, infuriating, impossibly hard; Hightower. Hightower: Named for having a..er..tower. It’s pretty high apparently. OK, I may need to explain why everyone in the community hates this map. But for those who are not familiar with the map, or the Payload Race game mode, I’ll start with you. 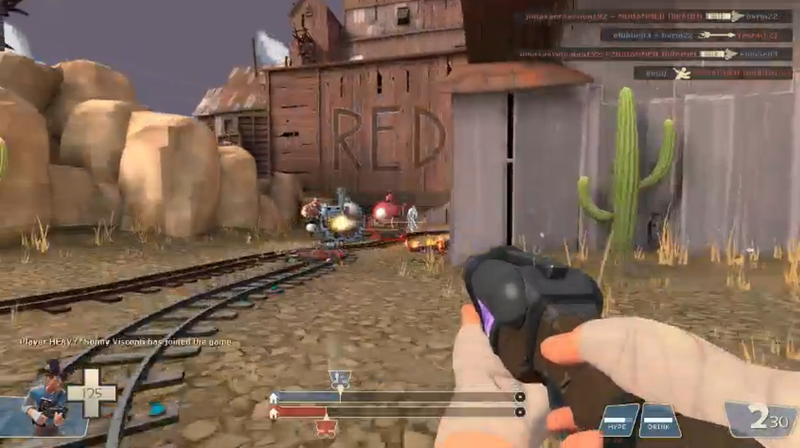 Hightower is a Payload-Race map in which both RED and BLU teams are assigned a payload (bomb-cart) in their teams respective colours. First team to deliver their payload to the opposite teams base wins the round. Win 2-3 rounds and you win the Payload Race. Unlike Pipeline & Nightfall, which adheres to these rules, Hightower has only one “round”. Thank goodness too. Now for why people hate it. It’s not badly made, not in the design sense anyway. Both payloads go through the courtyard, overlap tracks into each teams base, on a hill, then up to a precariously slow lift. 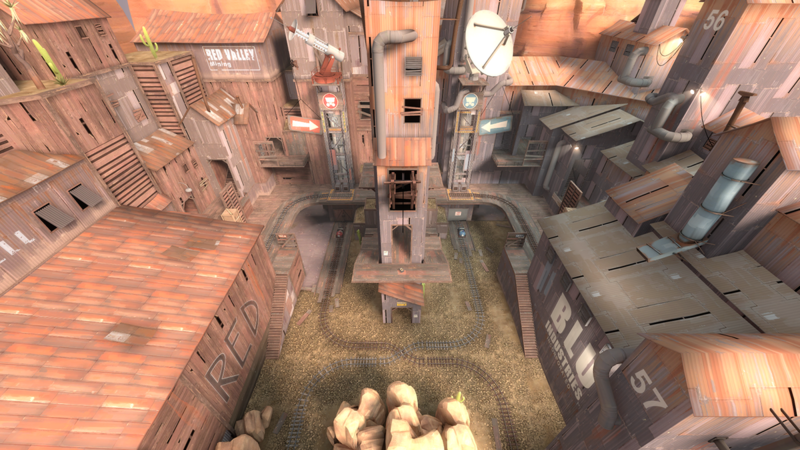 If you’re looking for a well-balanced map, then look no further than Hightower. No, It’s because It’s too well-thought out. Hear me out, I know that’s sounds crazy. Sorry, Heavy it was for a better cause…for winning! To make matters a bit worse for those watching from the outside (or better in my case) , Hightower has a halloween variant, aptly named “Helltower”, which is legitimately easier than it’s original counterpart. I spend more time on this one than on the original Hightower for this reason. Helltower, for those not familiar, has you pushing the opposite Teams’s Dead Employer (Blutarch [pronounced “Blu-Tark”] for RED, Redmond for BLU, both obsessed about Gravel) to “Hell” by means of a crack in dimensions…which is conveniently 10 feet off the ground. Like with other Halloween maps, you use spells littered around the god-forsaken map to your advantage. Those spells actually balance out the gameplay to such a level that it’s significantly easier to win in a much shorter time. I suppose the real problem is that it forces the two teams to have as much contact between the two teams as possible. 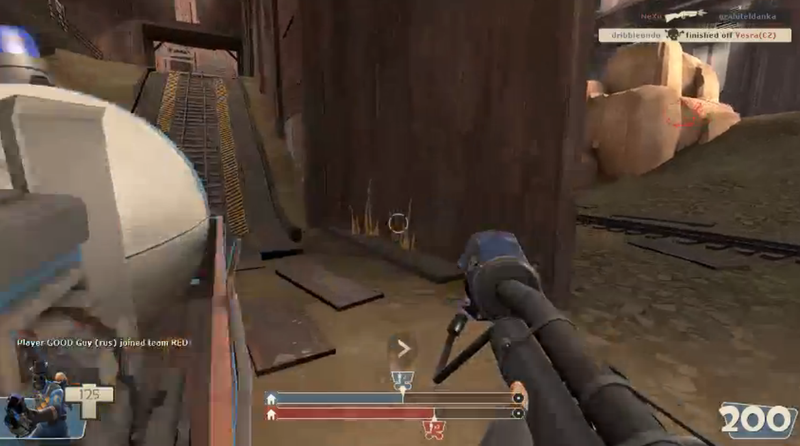 You can’t go very far on Hightower without running into the enemy team (or it’s payload). I don’t rant too often on matters that refer to Team Fortress 2, I don’t want to either. But I needed to get this problematic map out of my system. Normal service resumes soon. The Gadget Show said at the beginning of 2014 that the all mighty PC will die in said year. That prediction, while it didn’t come true in 2014; will come true in the next couple of years. What’s more likely is that PC’s and Tablets will work in tandem with each other. That’s my prediction though, so do take it with a grain of salt. Before you ask, no, this post is not a “Tablets Vs PC” post. For the moment, both have their advantages and disadvantages. Microsoft learned that the hard way with the release of Windows 8. All I want to do is share my experience with the tablet I recently bought to use for my Graphics Design Course (and to play on, of course). 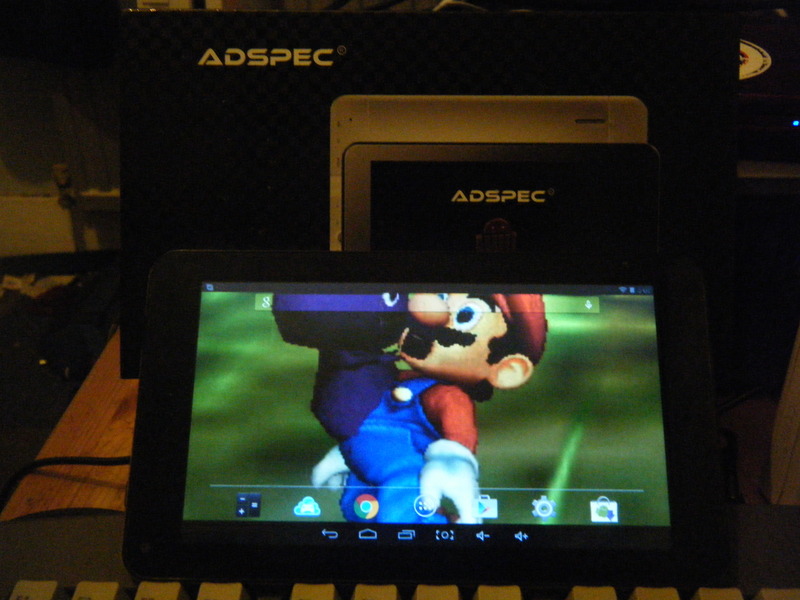 Before we get started, I must point out that the tablet I bought was intentionally small and intentionally cheap. And gold. 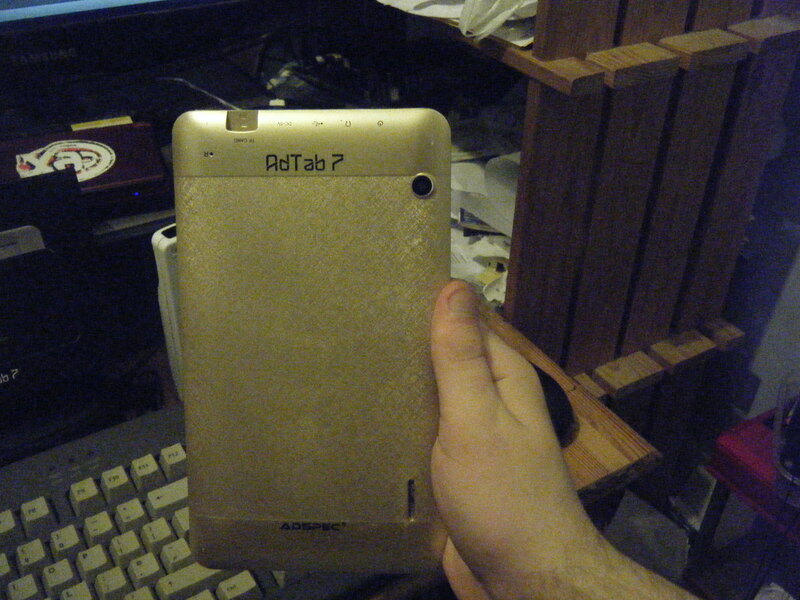 The tablet in question? 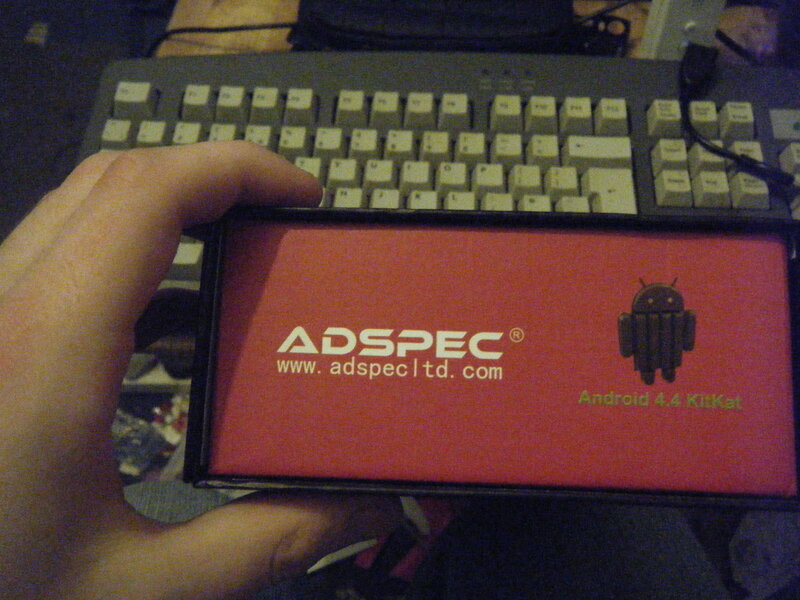 It’s an Adspec Adtab7, running Android Kitkat with 1GB of Ram and a 1.3GHz quad core processor. Never heard of Adspec? Until recently, neither have I. They’re a UK seller of cheap, Off-brand tablets, with their logo stuck on them. They seem to be going up in the world too, as they seem to have booked a slot at the aforementioned Gadget Shows Yearly event: Gadget Show Live. (albeit the 2014 edition) Legit? Maybe. Tablet any good? Believe it or not, Yes. The screen is 7 inches, meaning it’s the smallest tablet in my family…bigger isn’t necessarily better. Take note other siblings. 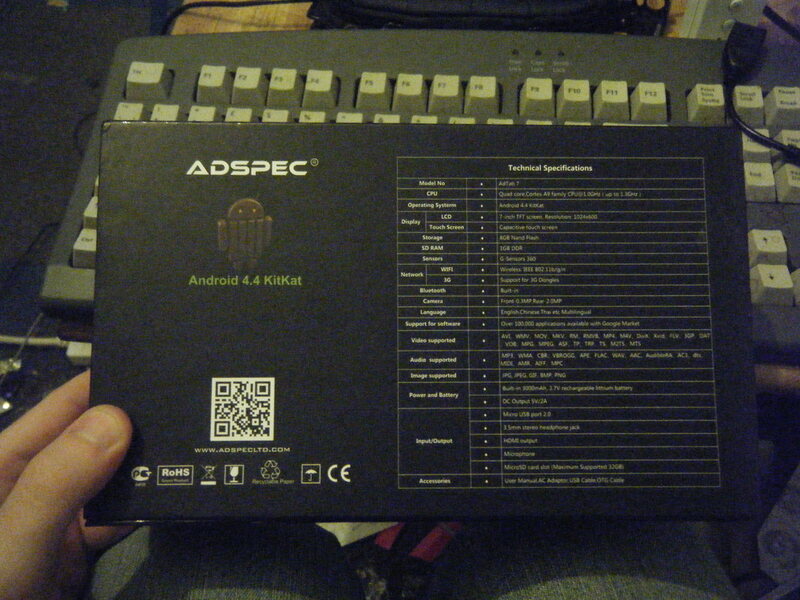 Back of box with QR code to the site, along with a specs sheet. As of writing, I’m using my tablet to write this. Not intentionally, my (currently being built) New PC is missing a Power switch, and I’m waiting for Amazon to deliver one. Hence this post. 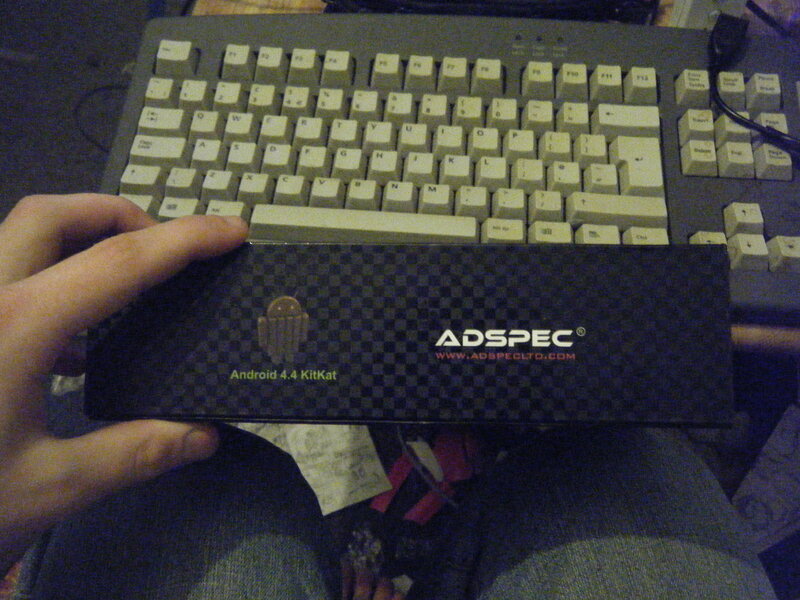 This said, if you’re all seeing this, then my typing isn’t too bad for print. PCMR Problems aside, I acquired a Micro USB Keyboard for my tablet in order to make workflow faster. That’s not to say typing on the touch keyboard is bad. It’s good for a few sentences or googling things, but for work, I stand no chance. Now, I don’t need a pie chart to tell you how many people use a Tablet for productivity and how many use it for Gaming purposes. The latter is the most wanted, that’s the tablet’s selling point at the moment. I downloaded a few Games to keep me going, like Jetpack Joyride, Riptide GP2 & Glow Hockey, as well as a few Emulators, MyBoy! (GBA Emulator) and Mupen64AE (N64 Emulator). No matter what I ran on my Tablet, my device chugged along rather nicely. The price for good games? Battery life and camera suckiness. Yeah, My tablet has an extremely bad battery (3000mAh for the nerds), which i suspect is to keep the costs down. Same story with the camera’s. The front was grainy everywhere, and, while I managed to take a few good photo’s with the back camera, it’s definitely not for the pro’s. Much to my surprise, my Tablet also came pre-rooted!, meaning that I could do screen recordings and mess around with the internal files all I want. I’ll keep you posted when I have more tablet/ PC rants =). I’ve known about this for several months now….can get pretty annoying very fast! Want to listen to Animal Crossing music while you browse the internet? Well there’s now a Google Chrome extension that allows you to do just that. The neat thing is is that the extension changes the music based on the time of day you play based on the system clock. The nifty little extension also includes the soundtrack for every Animal Crossing title released, so there’s plenty to listen to. It was only quite recently that RTS games got my attention. I remember this quite well, given that it was earlier this July. My intentions were to sift through my games library on my Wii and GameCube (and Steam, eventually), and at least play the games I had acquired throughout the past couple of years. One of those games was Pikmin. Bare with me on this. Okay, The idea of the game is that, as briefly and as vague as possible; you are Olimar, you crash your ship into planet, you befriend little Pikmin to help you recover parts from your crashed ship. End of story. While you go about using your Pikmin using strategic moves, you have a clock counting down the hours until Darkness arrives. When darkness approaches, you need to get back to your ship and sleep. and you do this for 12 days. That’s the Real Time Strategy part. Similarly, Don’t Starve is based on the same fundamental concept. You goal is to survive a randomly generated world without Starving. Or going Insane. Or just generally dying. 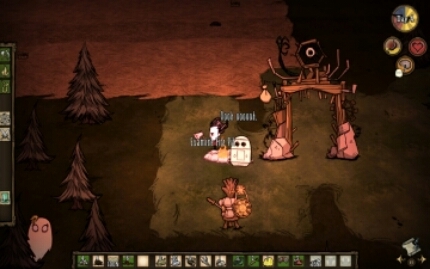 While there is no end aim in Don’t Starve, all you have to do is keep surviving with what you can find. It appeals to the kind-of Caveman instinct inside all of us. Don’t Starve then, is the goal. This goal is remarkably hard to achieve de solo, and gets even harder when the hounds are released upon you. To help you, you can create spears, axes, fishing rods and shovels, with the aid of Idea (and Alchemy) Machines, in order to fend off the Beastie’s, put wood on the fire, fish for food and, well, shovel dirt. Anyone for a Campfire song? 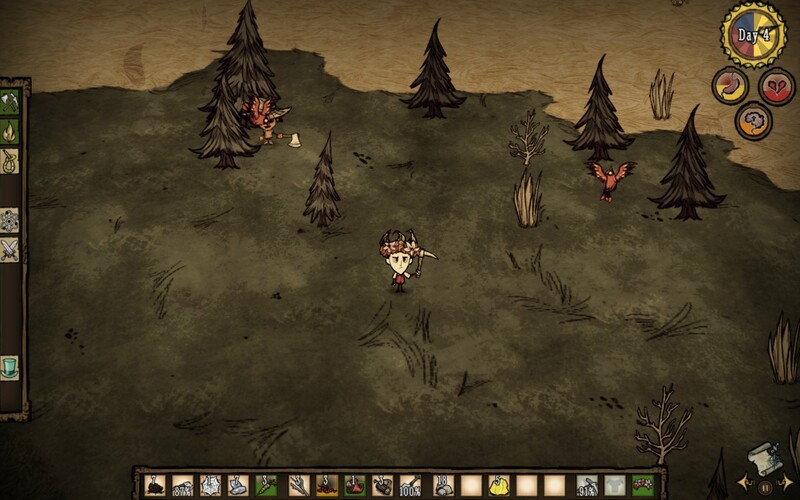 While Don’t Starve will take an age for me to complete, I can at least play the multiplayer beta version; Don’t Starve Together, without dying hopelessly on the 12th day. I will fully admit to playing this version for a lot longer than I did with the original game. I did manage to grab a key for it in the 2014 Steam Winter Sales – plus a second to give away, which was nice. 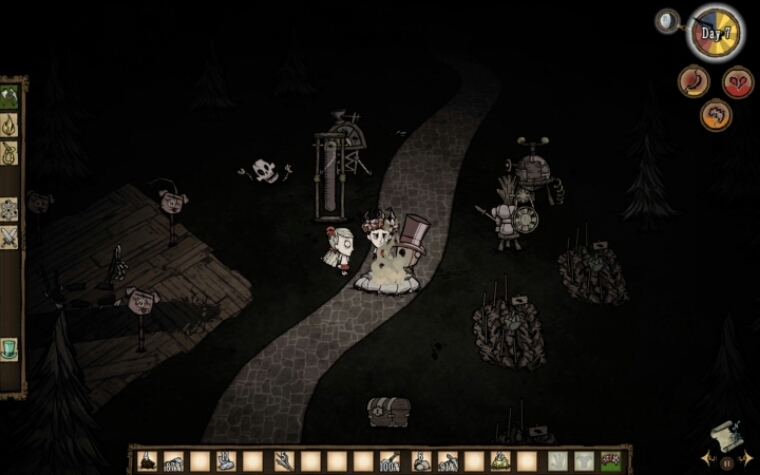 The game feels much more interactive when you have 2 Wilsons running about the place, even more so with Steam Chat enabled.